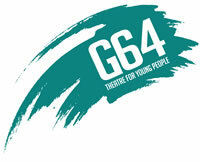 Group 64 is a dynamic and exciting Young People's Community Theatre Company, based in the heart of Putney. We believe in giving young people the opportunity to reach their creative potential in a safe and fun environment. We offer drama classes, opportunties to be in productions, holiday projects and much more! We aim to create powerful, exciting and thought provoking theatre and we are always looking for ways to think outside the box. We create work by and for young people from wonderful classics, such as The Lion, the Witch and the Wardrobe to new and exciting plays like DNA by Dennis Kelly. In June 2012, we were even chosen to perform at the National Theatre as part of the connections programme!